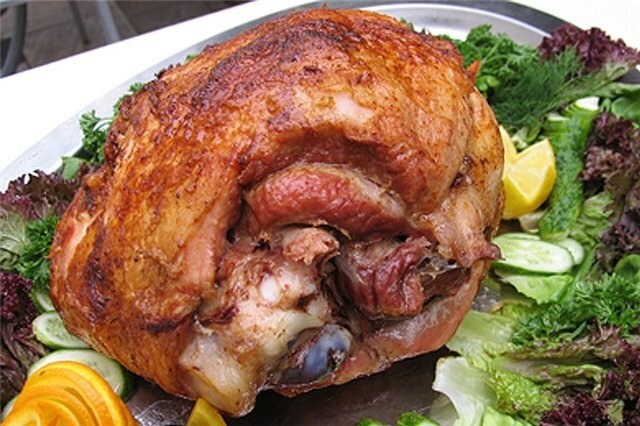 Oven baked pork leg with tender and juicy meat and crispy crust, is a perfect dish for the holiday table. Pork glazed with honey and mustard can serve, both hot and cold, put it on sandwiches. Before preparing this dish, marinate pork ham. On 6 litres of water you will need 5 tablespoons sugar, 1 tablespoon cumin, 1 cinnamon stick, 2-3 sticks cloves, 3 tbsp black pepper, 6 tablespoons salt, 2 onions (chopped), 4 cloves of garlic (grated), juice and zest of 1 orange, 1 teaspoon minced ginger root, 1 tablespoon chopped parsley. All the ingredients thoroughly. In the marinade, immerse the pork roast. Put the container in a cooling chamber for 10-12 hours. Before cooking, for 2-3 hours, place the pork that she found in the room temperature. Put pork leg in a fireproof container with high sides. This condition is necessary because in the process of cooking will stand out juice. Cover ham with foil. Preheat oven to 220-230 degrees. Bake the pork for 1.5-2 hours. Carefully remove container from oven. Remove the pork leg with skin, without damaging the fat. Allow the meat to cool slightly. Prepare a glaze of mustard and honey. Mix these ingredients until smooth. Put the slightly cooled ham to a clean dish. The juice from the container in which you cooked the meat, pour. Meat cut shallow horizontal and vertical strips (2-3 cm), creating a diamond pattern. Lubricate the entire surface of the ham ready glazed. At the intersections of lines slide on a stick of clove. Place the ham in a fireproof container. In a preheated 200-220 degree oven bake the meat for 20-30 minutes. Prepared pork ham serve in an open dish, garnished with fresh parsley and vegetables. Bon appetit!